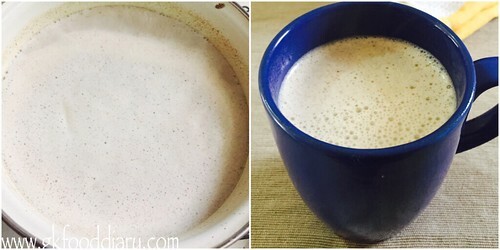 Ragi Malt Drink Recipe – healthy drink prepared from homemade ragi malt powder. 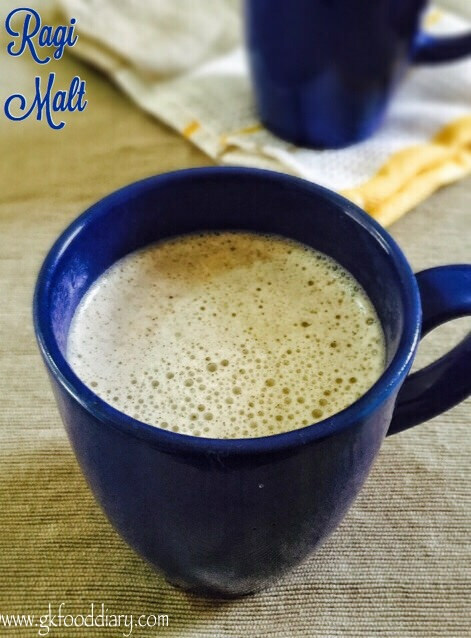 As promised in homemade ragi malt powder post, here is the recipe for ragi malt. It’s very quick to prepare, healthy and tasty too! 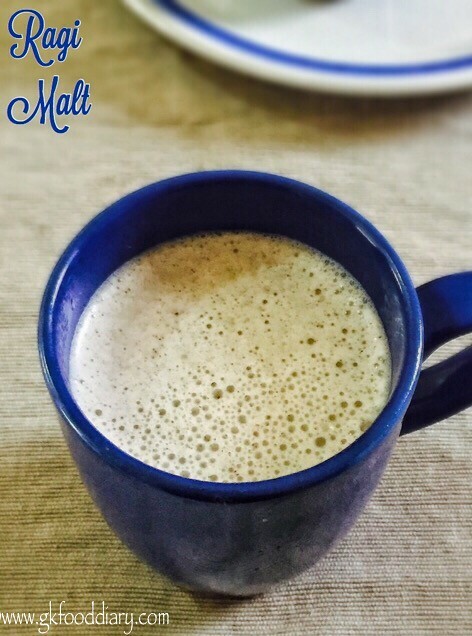 Do include this healthy homemade drink in your toddlers or kids diet at least once in a week to meet their calcium requirements.This ragi malt is even good for pregnant women and breastfeeding moms too. 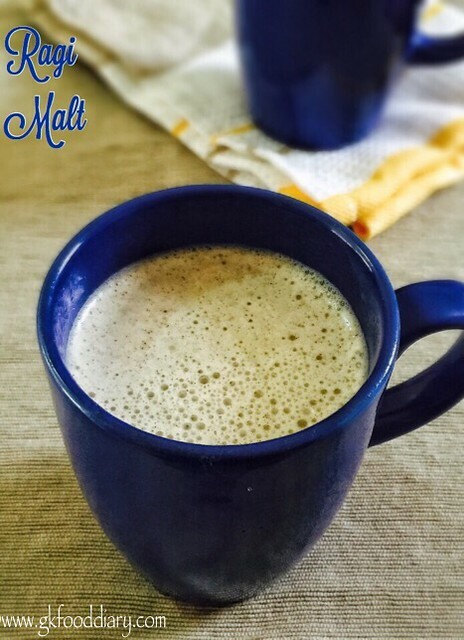 Now Let’s check how to make this ragi malt drink recipe for toddlers and kids. Keep all the ingredients ready. Take 2 tbsp of ragi malt powder and add ½ cup of water to it. Mix well with a hand whisk so that no lumps are formed. Cook the ragi malt powder in medium flame for 5 minutes or until it gets cooked completely & becomes shiny. Stir it continuously while cooking otherwise it may stick to the vessel. Once the ragi malt powder is completely cooked, add 1 cup of milk along with sugar/jaggery to the cooked ragi malt powder. Mix well. Boil it for 5 more minutes or until rolling boil. Remove from flame once done and cool it down. The malt drink becomes thick after cooling down. So switch off the flame accordingly. 1. Keep all the ingredients ready. 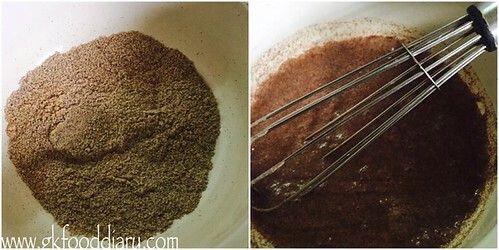 Take 2 tbsp of ragi malt powder and add 1/2 cup of water to it. Mix well with a hand whisk so that no lumps are formed. 2. Cook the ragi malt powder in medium flame for 5 minutes or until it gets cooked completely & becomes shiny. Stir it continuously while cooking otherwise it may stick to the vessel. 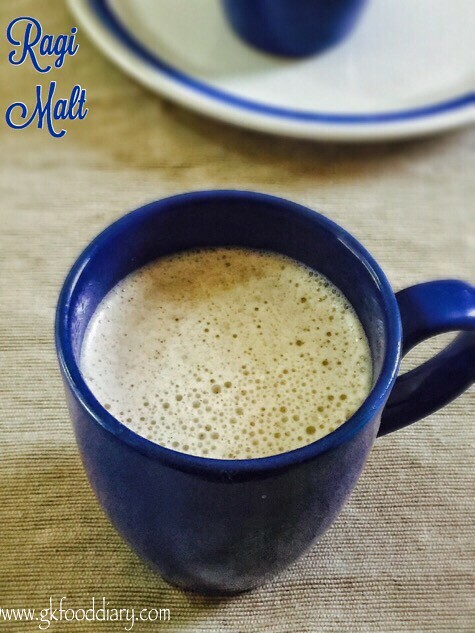 Tasty and healthy Ragi malt is ready to serve. Hope you found this recipe useful. The consistency of this drink should be pouring and it tastes best when served hot/warm. Generally this ragi malt powder doesn’t cause any allergies, but check for symptoms and stop feeding your baby if you find any. This ragi malt becomes thick when cooled down. So switch off the flame accordingly. Can we give this drink to 2 yrs baby daily? Mam can u pls say me the instant version recipe of that. For an instant version, you can soak handful of nuts and grind it. 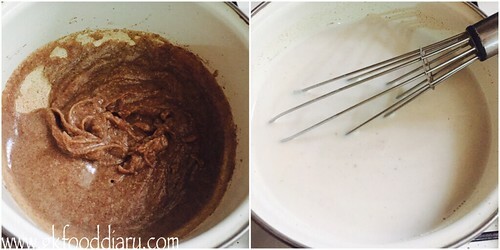 Take 2 tbsp of ragi with water. once cooked add nuts paste and milk. cook it further and serve!